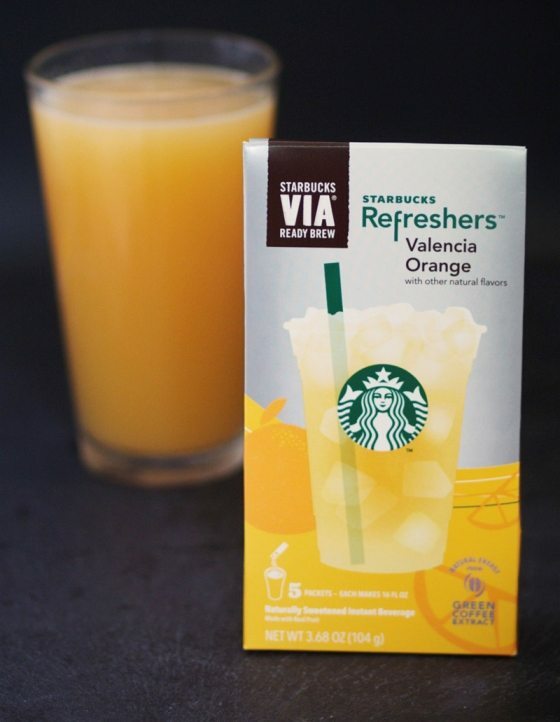 As of June 25th, Starbucks began offering a new Refreshers Via Ready Brew – it is the Valencia Orange Refreshers Via. There is a handcrafted version of the same in Starbucks stores. I assume it will be popular! I am not home in Seattle at the moment, and haven’t actually had the chance to try the Via version, but I do like the handcrafted Valencia Orange Refreshers. For those readers not familiar with “Via Ready Brew,” those are the little sachets with a powder in them. You add water at home to make your wonderful Refreshers. The “handcrafted” Refreshers are those that your baristas make for you at your neighborhood Starbucks stores. Currently, there are three flavors of the handcrafted Refreshers: Cool Lime, Very Berry Hibiscus, and Valencia Orange. You can order any of those three flavors at your neighborhood Starbucks store. If you want to try these handcrafted beverages, you can buy them for half price June 27 through June 29, from 3:00 p.m to 5:00 p.m. The hallmark of all the Refreshers is that they have a green coffee extract in them, meaning that the Refreshers have a little caffeine in them – it’s just a little bit more caffeine than if you were ordering an iced black tea at Starbucks. They are nice cold, refreshing drink for a hot summer day! Enjoy Refreshers Happy Hour starting tomorrow! That’s June 27th through the 29th, from 3:00 p.m. to 5:00 p.m., at participating Starbucks. Starbucks Expands Handcrafted Soda Test to Atlanta & Austin; Nashville Starbucks Testing the Cold Foam Mocha. What do you think of new Starbucks flavored Via Ready Brew? Thanks for the heads up, Melody! You rock. I got an email from Starbucks notifying me about this yesterday and your post reminded me how much I wish they had a Refreshers Via sampler back. I believe they do it with the coffee Via (but not iced coffee Via, if I remember correctly). Anyway, thanks for the great blog. Melody hope your vacation is an enjoyable one and you are relaxing. I have seen the new signage up for this and actually like the color scheme. On another note re new signs- has anyone noticed the new signs posting the calories for drinks? I have to say you need binoculars to read the sign because the word heading for calories is so small you would not see it unless you look carefully. I think it is a poor choice of signs and wish they would have thought more carefully about how to display this. Perhaps they really do not want to display the calorie count? @Mark Silverberg – Thanks for the nice comment! Just trying to spread the word. @Purple1 – Thank you. I’m sitting at my mom’s house, monopolizing her laptop this morning. I need to get off of it soon. I haven’t noticed the new calorie signage, but I should make a point of checking it out. We have had calorie information up on sign boards for years in Seattle, and so to be honest, I kind of tune it out. I wonder if yours in your area are different than those in Orange County or in Seattle. I think Orange County has had calories on menuboards for a while too! Just want to add in Canada (well, at least on the west coast), the 1/2 price Refresher promotion is from June 26-28 3-5p.m. 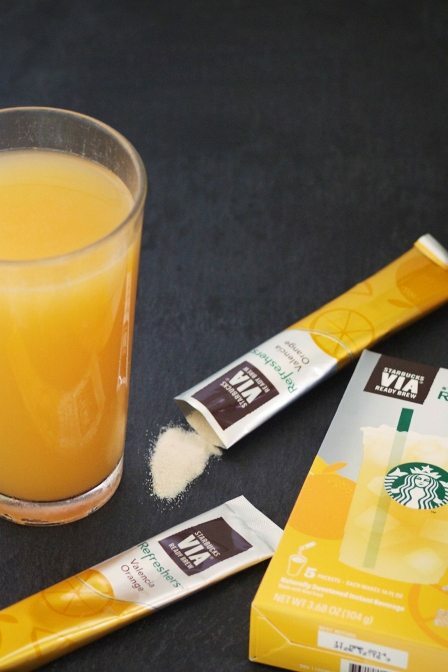 I didn’t know the Valencia Orange Refresher was also going to roll out in VIA form, I think it may become my favorite of the non-coffee VIAs (as long as it’s not too tart/acidic). I’m looking forward to trying both versions. I’m going to try mixing the Very Berry Hibiscus &/or Cool Lime w/ the new Valencia, doesn’t hurt, who knows- it may be a taste sensation! Regarding the base/source of the orange flavoring, will it be a syrup like the versatile Valencia Syrup they discontinued years ago? I used to order a Vanilla Bean/Creme Frap, w/ Valencia Syrup for a Creamsicle-type flavor- it was amazing. I hope this new drink means I’ll be able to do that again. Mel, one of the best things to do with the new Valencia Orange Refresher is a spin on the old BSL (blended strawberry lemonade). I’m surprised that it wasn’t released as another beverage. BOL (blended orange lemonade) would be the drink name. Outstanding! I have a lot of friends who are former partners and they were so excited because the name Valencia Orange Refresher lead them to believe that the Valencia syrup was back at the bux. Sadly it has not returned…the refreshers are good and I really like the Valencia Orange Refresher with no water and passion tea instead. Something I discovered last week was a hot Zen tea with a lime from the refreshers in it. It smells great and tastes better! Try the Valencia Orange Refresher with vanilla syrup. It cuts the tanginess and makes it taste like a dreamsicle. Kristina – Thank you for the great comment. Sorry I am late to reply. First off, I didn’t think of a Valencia Orange Green Tea Lemonade – I might have to try that. But what is the recipe? It seems like the lemonade might overpower all else. And it is so cool that your local store manager already knew of my blog! That put a smile on my face! Just wanted to clarify the name of the drink I sampled: it was a Valencia Orange Lemon Ale (non-carbonated), not a Valencia Orange Green Tea. Oops! Love the new Valencia Refresher – best in the line. Now – please quit being so cute and stop using a tiny white font against a yellow background to describe the directions for preparing this delicious drink. What are you thinking? Who can easily read this. That alone is a reason I may not buy it again.